Additive manufacturing promises enormous geometrical freedom and the potential to combine materials for complex functions. We demonstrated concurrent printing of all points within a three-dimensional object by illuminating a rotating volume of photosensitive material with a dynamically evolving light pattern. We print features as small as 0.3 mm in engineering acrylate polymers, as well as printing soft structures with exceptionally smooth surfaces into a gelatin methacrylate hydrogel. Our process enables us to construct components that encase other pre-existing solid objects, allowing for multi-material fabrication. We developed models to describe speed and spatial resolution capabilities. We also demonstrated printing times of 30–120 s for diverse centimeter-scale objects. We developed a method, Computed Axial Lithography (CAL), that allowed us to synthesize arbitrary geometries volumetrically through photopolymerization. The CAL approach has several advantages over conventional layer-based printing methods. The method may be used to circumvent support structures as it can print into high viscosity fluids or even solids. Printing 3D structures around preexisting solid components is also possible with our approach. CAL is scalable to larger print volumes, and is several orders of magnitude faster, under a wider range of conditions, than layer-by-layer methods. Soon, Star Trek TNG and beyond replicator technology will be here and we can all relax, never to shop again. 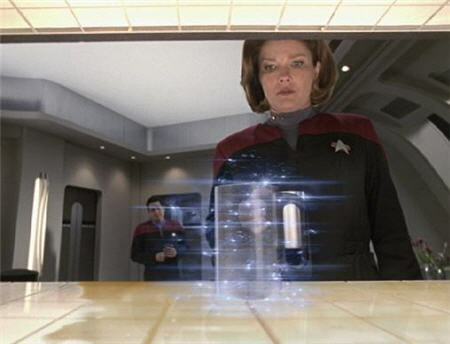 In the fictional series, a replicator can create and recycle objects, synthesize meals on demand, and even allow the crew to shop for and obtain unusual articles that would not ordinarily be stocked on a star ship.